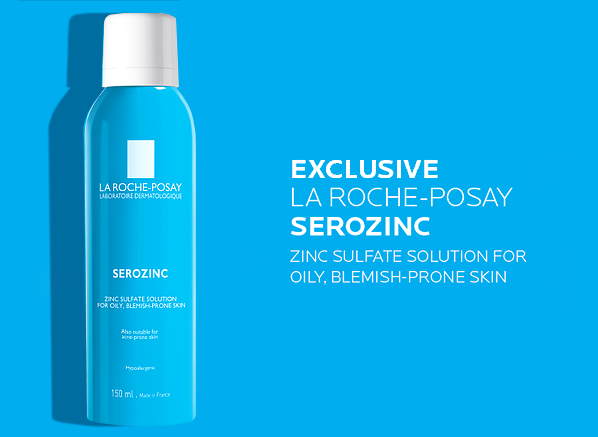 The much-loved French pharmacy favourite, La Roche-Posay Serozinc, is readily available to UK fans for the first time ever – and it’s exclusive to Escentual.com! Revered by skincare experts, beauty bloggers and Francophiles alike, the spray-on, isotonic blend of thermal spring water and zinc sulfate has been soothing, toning and mattifying complexions on the Continent for years. And now you don’t have to take a trip over the channel to stock up on your cans because Serozinc has been inducted into La Roche-Posay’s cult Effaclar range – permanently! Serozinc is a unique mist toner that is ideal for oily and blemish-prone complexions. The reason it’s so great for this troublesome skin type is its astringent infusion of zinc sulphate (0.10%) and sodium chloride (0.75%), which works to tighten pores, prevent excess shine and refine the skin’s texture. These ingredients are also renowned for their soothing and healing benefits, making Serozinc superb for improving the appearance of blemishes and marks. Serozinc is exceptionally versatile. As it’s primarily a toner, it’s really easy to incorporate it into your routine between cleansing and moisturising, and it can also be used at any time of day to refresh, cool and instantly mattify your skin. Simply hold around 8 inches away from your face and spray it all over; the mist is ultra-fine so there shouldn’t be too much excess, but if there is gently pat with a clean towel. Follow with an oil-free, non-comedogenic moisturiser or treatment like Effaclar Duo +. It’s so gentle, yet so effective! Incorporating this all-star spray into your skincare routine is as easy as a quick spritz after cleansing and before moisturising to ensure that your skin is boosted with healing, soothing and mattifying care. This entry was posted on Monday, December 8th, 2014 at 7:30 pm and is filed under French Pharmacy, Skincare. You can follow any responses to this entry through the RSS 2.0 feed. You can skip to the end and leave a response. Pinging is currently not allowed.